Warsaw, the capital of Poland, is a city that has seen many wars and has earned the name “The Phoenix city”, having risen from the ashes of so many invasions. The legend goes that it was founded by a hunter who discovered a mermaid in the Vistula River and fell in love with her. Because she could not leave the river, the hunter settled by the shores and from there, the city sprouted, straddling the Vistula, its name an amalgam of the name of the hunter and his mermaid, Warszawa (pronounced ([varˈʂava] in Polish). Today, the mermaid makes her appearance as the city’s symbol, on its coat of arms and in statues and reliefs, bearing a shield and a sword. Creative, yes. But the legend of the warrior mermaid protecting this city has not kept away Poland’s more powerful neighbours from sweeping into the country, almost at will. True, Poland’s history is replete with war and invasions by every major power in Europe. After four major partitions, Poland as a country seems to vanish, (at one time for over a century) and reappear on the world map indiscriminately, thanks to the people of that country, who always pull it back from the brink of extinction. Warsaw in the autumn is a charming city, with the yellowing foliage casting it in subtle glow. Especially at the Lazienki Park, Poland’s largest. It covers some 76 hectares of the capital and was designed in the 17th century. It is here, among the trees and glades, that some key moments of the city’s, and the country’s history, played out. It was here that the last Polish King Stanislaw August Poniatowski reigned, loved and lost his kingdom, resulting in the 3rd partition of Poland among several European powers in 1795. And for a century thereafter, Poland disappeared from the map. At the entrance to the park stands the towering statue of a fierce looking Marshal Jozef Pilsudski, with shaggy brows and thick moustache. He is the man credited with the founding of the Second Polish Republic in 1918 on the heels of WW1, reclaiming the country’s place on the map for the first time since 1795. He marshalled the Poles to defeat Soviet troops in 1920 to reaffirm the country’s independence. The statue was commissioned only recently as Pilsudski had been obliterated from Polish history after the country fell under the control of the Soviet’s at the end of WWII. The Soviet’s finally found a way to get back at the man who had routed their armies and halted the march of communism into Western Europe. His name was only whispered while Poland was locked in the grip of communism, until 1989. But Pilsudski’s fierce looks should on no account be held as a standard. The Poles are mostly kind, soft-spoken people, who have the misfortune of being surrounded by powerful, ambitious countries. Despite its many wars, the most famous Pole ever, and one reckoned as the greatest, is not a military hero but a priest – a certain Karol Jozef Wojtyla, who the world knows as Pope John Paul II. And like him, most Poles are amiable people committed to the quieter things in life. 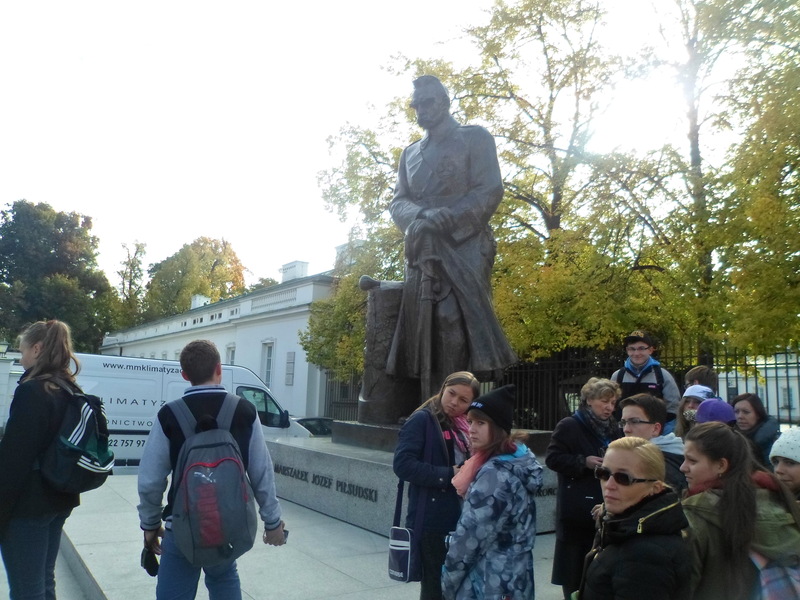 Inside the park, the Frederic Chopin monument is located in prime spot. Chopin, Poland’s next most famous son, is depicted sitting under a willow tree with a melancholic expression, as if weighed down by the enormous talent that had defined his life and death (he was ill most of his life), and by extension, the burden of existence his country has had to deal with. The famous composer died in Paris just aged 39 but his memory and music live on. At strategic locations in the park, and in Warsaw, there are benches that play some of Chopin’s composition at the push of a button. He is that highly regarded in a country he left at 21. Further in, there are palaces, built mostly in the 17th century, combining architectural styles from various backgrounds, the result being some aesthetically pleasing structures in a serene park like the impressive Palace on the Water, the home of the last Polish King. Amidst the temples and orangeries and the little White House, whose walls are privy to some royal romance, there is an officer’s cadet’s barrack, where one of the many uprisings that dot Polish history began. The Poles are famous for many uprisings, something they are proud of, even if most of them were not successful. But considering the many armies that have invaded Poland, and the many uprisings of the Poles, the people are very warm and friendly. And with such a people, you wonder why anyone would want to wipe them clean off the face of the world. Yet, that was precisely what Hitler wanted to do. If he had succeeded, the Warsaw I saw, hemmed by autumn leaves and warm, smiling people, would not have been there. It would have been replaced by a settlement for some 10, 000 Germans. With this agenda in mind the Nazis rolled their tanks into Poland and started WWII. Attacked simultaneously by the Nazi’s on one side, and the Soviets on the other, Poland was doomed. And during the 1944 Warsaw uprising against Nazi occupation, 85 per cent of the city was destroyed and some 60 per cent of the population (800, 000 people) was killed. Poland was, during the war, a Nazi incinerator of some sort. The Warsaw Ghettos were set up to house the Polish Jews, many of whom were moved to the concentration camps elsewhere in Poland, the most infamous being Auschwitz, in the South of the country. And if there is an enduring legacy of loathing the Poles have for the Germans, it is for these reasons. One Pole I spoke to said her grandfather hid in the forest for four years during the war, and she was carrying on his grudge for him. With the war eventually over and most of Warsaw and Poland lying in ruins and left at the mercies of the Soviets, the Poles decided to rebuild their country, brick by brick. Well, where that was possible. The historic centre of Warsaw was rebuilt down to the smallest detail from some 30 paintings by Italian artists Bernardo Bellotto commissioned to paint the city in 1764 by the last Polish King. That part of the city is now a UNESCO world heritage site. Walking down the cobbled streets of the historical centre, there is an old man playing a wind instrument on the sidewalk, acknowledging dropped coins with a smile and a nod. His melody is infinitely sad, even when he attempts to play a happy tune, as if trying to recapture something that was lost, something that the wind had shattered and dissipated. Despite the tremendous efforts and sacrifices of ordinary Varsovians, who dedicated endless hours to rebuild their city, despite the amazing work, the overwhelming feeling for me was that of something irretrievably lost. The Royal Palace at the centre of the historic city and even the cornices tried to remain faithful to the originals; it looked as picturesque as Signor Bellotto’s paintings, complete with the grand red brick Royal Palace, the quaint little houses in the corner, the market square. Copies of the paintings are showcased down the street for visitors to see and appreciate. It was a lesson in quiet perseverance. But further away from the historical centre, the architecture is a fusion of sorts, a result of the different influences that were brought to the post-war reconstructions. Many migrant workers came with their ideas of architecture, and there were those who desired the construction of a totally modern city while others pinned for a restoration of the original. And of course there were the overlords, the Soviets, who imposed their socialist realisms in the architecture, putting up giant grey structures that celebrated the working class people. The most impressive of these buildings and the biggest structure in the whole of Warsaw is the Palace of Culture and Science, a “gift of the people of the Soviet Union to the people of Poland”. Completed in 1955, it remains the tallest building in the capital, (and the 6th tallest in the European Union) embellished with statues, carvings and reliefs of working class people in all their glory. After the collapse of communism in 1989, the fate of the impressive structure was debated. Some people wanted what would remain for them a symbol of communism torn down. Others prefer to keep it. Now it is visible from all parts of Warsaw and at nights, it glows in a dreamy lilac light. I understand the light theme is changed every year. It is also a major tourist destination as visitors get to take in the whole of Warsaw from the huge windows of the top floor while enjoying the showcase of scientific and cultural exhibits that fill the other floors. From its window’s one can see the impressive greenery of Warsaw, the lush lawns and colourful hedges that line the streets as well as the ambitious skyscrapers creeping heavenwards, one of them poised to replace the Palace of Culture as the country’s tallest building. It is a massive, massive structure. But all around it, the ambience of Warsaw is changing, from an impoverished communist country to a nation eagerly bursting into capitalism, with glamour shops lining the streets. In Poland, one can’t complain about the cuisine; the food is filling and the variety impressive. But for an African visiting Warsaw, a visit is incomplete without stopping by at La Mama, a Nigerian restaurant, broadly tagged an “African restaurant” that serves typically Nigerian food, from Amala to pounded yam and a range of soups from Okra, oha or egusi soup, or even the famed pepper soup. Don’t be surprised though if there are more Poles than Africans at La Mama, enjoying the meals and nodding to the beats of Fela or some contemporary Nigerian musicians seeping out of the speakers. They will smile and talk to you, the wonderful people of Poland, whether at restaurants or one of the numerous arts exhibition in Warsaw during the autumn, for which they have so much appreciation, and you will wonder where the resilience and indomitable spirit comes from. How can a people go through all the Poles have gone through and remain so nice? Perhaps it is the charm of the mermaid or just the realisation that the most beautiful thing about Poland is its people. There’s life to this… I once said your travelogues are really cool. I still think so. Would definitely come to read this again. Well done. A more intimate view of Poland from a talented traveller and award winning writer, Abubakar Adam Ibrahim.